Inflatable life-jackets take their up-lift from a large bubble of air. The advantage is minute volume when deflated and respective wearing comfort. 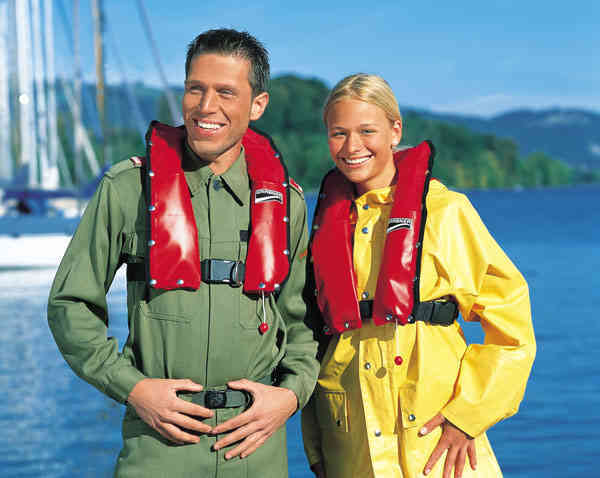 Automatic life-jackets trigger functions are, fully automatic, semi automatic and manual. Unconscious safe lifejackets.e. Use:MOTOR BOAT, SAILING, WORKING life-jacketand for fishermen, hunter. Fully automatic: Upon contact with water the trigger- ring desolves and thus activates the CO2 cartridge. Semi automatic: Manual activation of the CO2 cartridge by pulling the toggle-string. Manual: Inflation by mouth via the air-valve tube. The swim bladder is rolled up and enclosed within a protective outer sleeve, the press studs and Velcro fastening of which burst open when the bladder inflates. Deflation by pressing the opening valve contained in the tube for manual inflation. 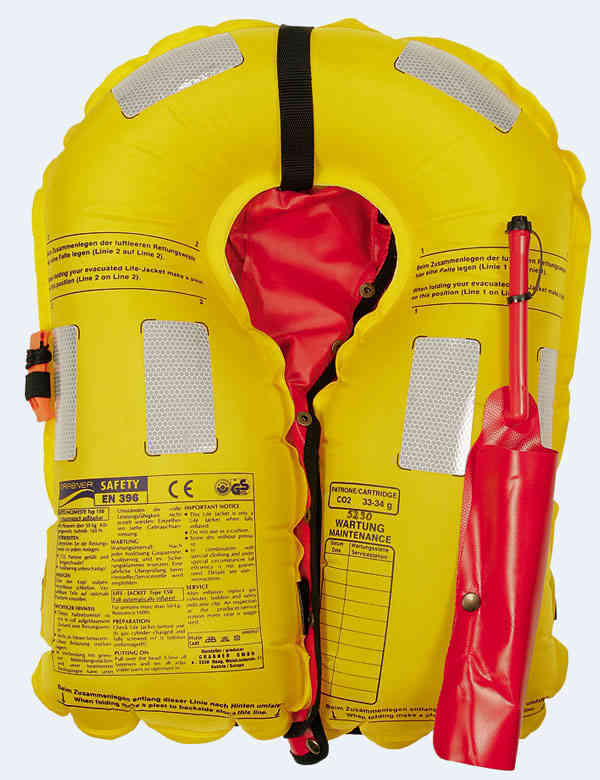 If commercially used, life-jackets with air-automatic facility ought to be given maintenance checks at the latest after 2 years, and annually thereafter. 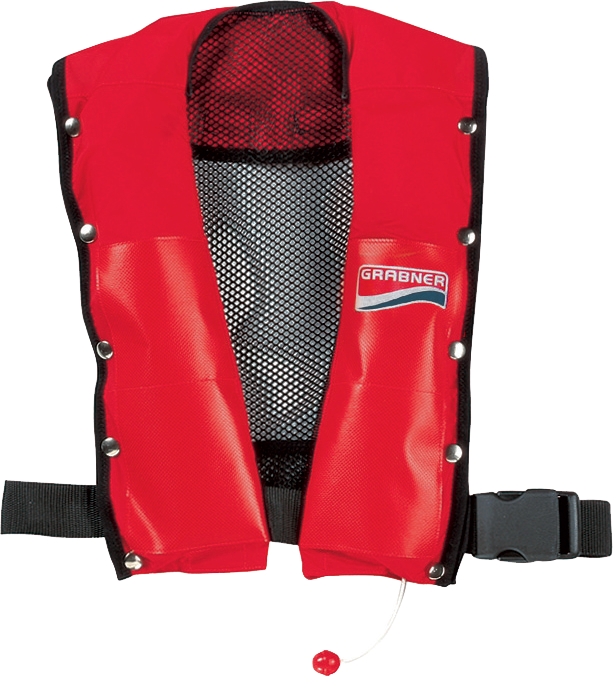 After 10 years the life-jacket should be replaced in any event. No maintenance is mandatory when privately used. In the interest of safety it is recommended, that the same conditions though should be applied. Every maintenance check is recorded and confirmed in writing on the air-bladder. After inflation replace gas cylinder, bobbin and safety indicator clip. An inspection at the producer/service station every year is suggested. ATTENTION: This item can not be sent by air (due to dangerous goods regulations). The shipping costs therefore apply only to the land / sea route. For air freight, much higher shipping costs apply, which can be communicated to the order after receipt of the order.